Research suggests that this sort of transparency does make a difference in terms of bidder numbers and composition. Yet it remains an open question whether public procurement transparency is necessary or sufficient for controlling corruption in public procurement. 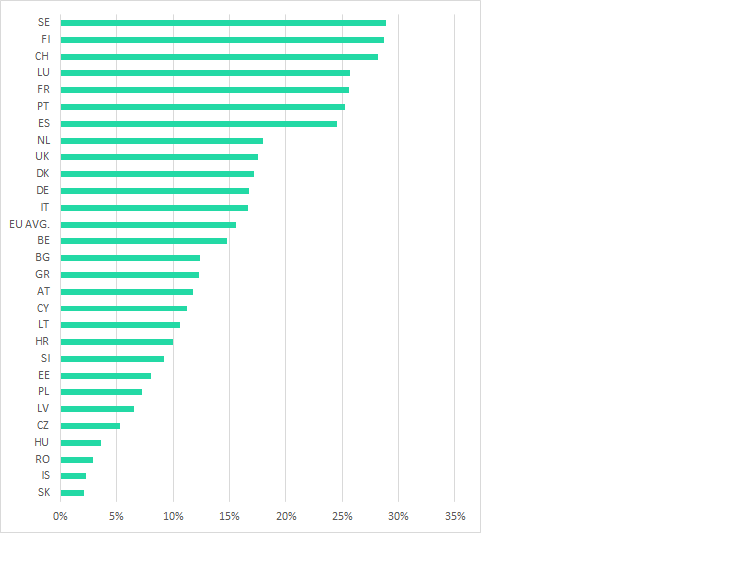 Indeed, if one looks at a sample of European countries’ public procurement transparency and their suspected corruption risks, one finds a surprising result: the best governed countries in Europe have the lowest levels of transparency in public procurement. Consider, for example, the monetary thresholds (for contract value) that trigger mandatory public advertisement of government contracts. If these thresholds are high, a lot of public spending goes unnoticed by potentially interested bidders and civil society monitors. But, as the bar graph below shows, these monetary thresholds tend to be lowest in high-corruption-risk countries such as Portugal, Cyprus, Armenia, or Georgia. In contrast, well-governed countries such as the Netherlands, Germany, or Austria only require publication of contracts above the higher thresholds set by EU Public Procurement Directives. Consider next, the question whether the country maintains a single national website for public procurement information—which can decrease the cost of obtaining information and finding relevant tenders. Austria, Luxembourg, and Sweden, three high integrity countries, stand out by not even having a public platform, only private portals; Germany and Italy also limit transparency in procurement by having multiple partially overlapping platforms, making it difficult even for researchers to understand which tenders appear on which site (for details see Digiwhist). Perhaps even more important than the monetary thresholds or accessibility of the websites is the amount and type of procurement information that must be publicly disclosed. European countries’ national reporting requirements vary widely. The UK is at one extreme, only requiring publication of a handful of key variables such as the name of the winning firm and the contract value. At the other end of the spectrum are countries like Hungary and the Czech Republic, which require publication of over 200 variables for almost all contracts. (These variables include things like the details of legal remedy bodies, scoring rules, and product descriptions.) In Slovakia, even the full contracts and the submitted bids are publicly available. (All that said, only one well-country — Norway — reports the actual payments during the implementation of the contract.) The map below–where darker shading indicates that more information is available–illustrates the variation. One might object that the formal requirements on the books matter less than what happens in practice. Remarkably, though, when one focuses on the quality of the actual data reported, the patterns identified already continue to hold: countries with the highest amount of missing or erroneous information are the best-governed countries of Europe: Sweden, Finland, Switzerland, or Luxembourg, while the countries with more complete records are include many countries widely perceived as being highly corrupt: Slovakia, Iceland, Romania, or Hungary.This is illustrated in the chart below, where the length of the horizontal bar indicates the percentage of erroneous data. In sum, looking across a range of possible measures, it seems that transparency in public procurement is inversely associated with perceived quality of governance: countries with high-integrity public institutions tend to have the lowest levels of transparency, while countries with high corruption risk institutions tend to have the highest levels of transparency in public procurement. What’s going on? Consider two possible interpretations. First, perhaps transparency in public procurement (on the strong definition of transparency used here) is not a necessary condition for maintaining integrity. Indeed, it might not even be particularly strong contributing factor. Maybe other, less stringent forms of transparency (such as local advertising) are sufficient. Or perhaps other good-governance institutions (such as a meritocratic bureaucracy, or an independent and well-resourced judiciary) could step in and fill the gaps left by insufficient transparency. Importantly, on this interpretation, a high degree of transparency in public procurement might still be necessary for the transition from a situation of high corruption to one characterized by high integrity. Second, a grimmer alternative is that transparency is indeed fundamentally important for maintaining integrity in public procurement, and that many of the countries perceived to be of high integrity are much less clean than we thought. Perhaps our perceptions of good public institutions are biased—for example, the prevalence of petty bribery in a given country may color overall corruption perceptions but may not be that closely correlated with high-level procurement corruption. 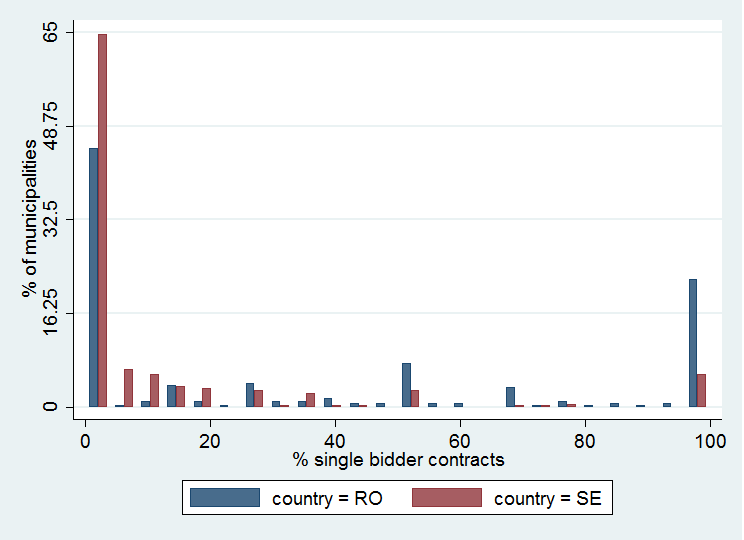 Such an explanation is supported by the below graph showing the distribution of Romanian and Swedish municipalities according to their share of single bidder contracts in 2015 (i.e. nominally competitive contacts where only one company submitted a bid). Single bidding on competitive contracts is an objective corruption proxy increasingly used in academic research and policy making (see for example here, here and here). What is apparent is that the distribution across municipalities within each country of the frequency of such contracts is rather similar. (Only the extremes differ, with Romania having somewhat more high-risk municipalities, and fewer low-risk municipalities.) If corruption perceptions are driven by salient extreme cases, these two countries are likely perceived to be more different than they actually are. While the association between levels of transparency in public procurement and control of corruption is by no means decisive evidence on the causal relationship between these two variables, it is nevertheless informative, and ought to prompt more systematic and careful inquiry into whether transparency is necessary for maintaining integrity in public procurement, and whether countries currently perceived as having relatively “clean” procurement systems deserve that reputation. This entry was posted in Guest Commentary and tagged Digiwhist, government contract, Government Transparency Institute, Mihály Fazekas, Open Contracting Data Standard, public procurement, Romania, Sweden, transparency by Matthew Stephenson. Bookmark the permalink. This is fascinating, and in some respects troubling. My initial, instinctive hypothesis as to the reason for the inverse correlation you report was a variant on your first bullet point, though I might frame it differently: Countries that struggle more with widespread corruption in public procurement are more likely to adopt stricter transparency rules as a way to address that problem; countries will less of a (perceived) corruption problem are less likely to adopt such stringent rules. (To use the jargon, the transparency rules are endogenous to the level of corruption.) It’s a bit reminiscent of the fact that countries that have an independent anticorruption agency typically have _higher_ levels of perceived corruption, on average, than countries that don’t — the creation of an ACA is a consequence of high corruption levels, not the cause. It may well be that the same thing is going on here. That said, your comparison of Sweden and Romania may cast some doubt on that interpretation, though I’m not so sure that your graph doesn’t show that the corruption problem is indeed bigger in Romania, even if it’s concentrated in a relatively small number of municipalities. The gaps at both the low end and high end look pretty big to me. And again, one could certainly imagine that Romania, facing the problems the graph suggests in at least some municipalities, would be more likely to adopt stricter pro-transparency measures. Even if those measures helped somewhat — even if the percentage of single-bid contracts were lower than it would have been otherwise — one could still see the patterns that appear in your data. Thank you for the post. I share Professor Stephenson’s hypothesis that it may be partially explained by the fact countries with higher perceptions of corruption are more likely to institute stringent reforms. One way to explore this hypothesis would be to examine the perceptions of corruption over time. If the hypothesis is correct, I suspect we would see public discontent with corruption grow over the years, and then the government would respond with stricter or new transparency rules. More importantly, looking at corruption perceptions over time after the reforms were implemented could help answer the question of whether transparency is good, bad, or indifferent. If perceptions continued to worsen or remained stagnant after reforms, it would provide evidence (although not prove) for the argument that transparency is ineffective. But if public perceptions improved, the case for transparency would be stronger. In any event, I’d be interested to see researchers dig deeper into the data to try to answer these sorts of questions. @Matthew, Eva and Nino: I thank you for your comments and suggestions. Indeed, the analysis is only rather superficial, highlighting interesting facts and raising some questions and hypotheses with the aim of inspiring further research. The kinds of comments you just made! I certainly agree that introducing anticorruption tools such as more transparent procurement data frameworks is often a reaction to high degrees of perceived or observed corruption. I guess the question is whether not perceiving corruption and hence not introducing those state-of-the-art anticorruption tools in places like Sweden misses a great opportunity for further curbing corruption. In fact, Sweden is currently discussing a new public procurement law with one key debate revolving around the general lack of oversight and transparency. I also completely agree that on average Romania is still more corrupt than Sweden using objective procurement corruption risk indicators. Nevertheless, the difference is not that of a completely different distribution of risks, rather some degree of overlap with some degree of divergence. I also have to side with Eva who is saying that transparency can serve anticorruption as part of a wider institutional environment. Hence, my question about to what degree the apparent lack of transparency of public procurement in a number of high integrity countries can be compensated for by their meritocratic bureaucracy, active civil society, investigative journalists, etc. Fundamental research questions with great policy relevance, but unfortunately, none of us has solid answers to them, we are only beginning to understand these institutional complementarities. I am glad to say that the DIgiwhist project also set out to track legislative changes such as changes to public procurement reporting requirements or reporting thresholds over time exactly to do the kinds of analysis Nino is suggesting. Watch europam.eu in the comings 1-2 months for more data on institutions which can be coupled with public procurement contracts data and corruption proxies over many years. I feel that the somewhat surprising finding that countries with less perceived corruption also tend to be less transparent in their public procurement process mostly explained by your first point (as supplemented and reframed by Professor Stephenson): voters and civil society groups are less likely to demand high levels of disclosure when there is less of a concern for corruption. That said, I am particularly interested in the different models for disclosure/transparency countries use and what accountability mechanisms are enhanced by increased disclosure. This ties into Mihaly’s and Eva’s points to a certain extent – if the mechanisms (judicial enforcement, investigative journalism, civil society watchdogs, political accountability, etc.) that most benefit from transparency and information are not functioning properly, is there any real value-add to easily accessible disclosure? Is the information provided a weapon that no one is capable of or politically willing to wield? Does it serve as an easy and relatively low cost shield that government’s can use to claim they are being ‘open and transparent’ without having to implement substantive changes to their procurement process? A cross-country or within country comparison of ‘transparency methods’ (full contract publication, web access, etc.) combined with a qualitative survey of bidding outcomes or shifts in corruption perceptions over time (as Mihaly and Nino highlight in their posts) could be an interesting place to start. Trying to figure out whether it is more important for bidders to have the information in order to compete more effectively, for civil society groups in order to name and shame particular agencies, or for prosecutors to pinpoint hotspots where the procurement process might be tainted, might be helpful to figure out who needs what data and how best to provide it given the mechanisms available within each country. Building on Travis’ comment, I also think that figuring out who needs what data is a key for better understanding the effects of transparency and contingencies of those effects. And a further point to add to these questions: data in which format. This is a point I touched on a bit in the blog, maybe the kind of centralized, electronic, so to say Big Data-driven transparency is not what is most needed. I countries like Sweden, anyone can ask for the procurement documents held by municipalities and other government agencies. And in fact, there are journalists, etc. asking for and receiving such documents. If such local channels of transparency are working one might not need state of-the-art procurement data frameworks that much – of course this is an open question. I also think that corrupt governments facing international pressure have learnt quite well how to play the transparency game, i.e. showing that they fight corruption by opening data up, but making sure that the full impact mechanism is broken so that nothing really changes, or if unexpectedly open data really starts to bite they close down again (see e.g. Hungary and recent backtracking on procurement transparency). Then, it is our responsibility to make sure that we demand transparency that matters for anticorruption and look at the whole impact chain not just at a database on its own. This post raised an interesting question about how much transparency can do and I have been thinking about this since I read this post the day it was posted. I agree with Travis that when the mechanisms that benefit from transparency and information are not functioning properly, transparency itself probably cannot do much. In China where the levels of both (perceived) corruption level and transparency requirement in public procurement are relatively high (not sure how high compared to the EU though), we have seen cases where the government or state-owned entity and private bidders colluding together in public tendering to circumvent the disclosure rules. They cut private deals of who should win a particular contract in advance and the bid-winner-to-be would find other companies in the same industry to accompany in bidding to fulfill the formal requirements. Then this bid-winner, in turn, would help their friends-competitors to do the same in other bids. In the meantime, people are complaining that these dysfunctional formal requirements only significantly increased their administrative cost of doing businesses but not curbed corruption. As Mihály later pointed out, the key probably is to figure out who needs what data so that transparency can serve as a better tool to deter/combat corruption.